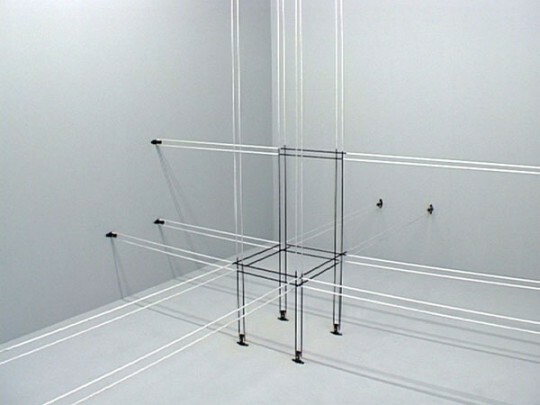 In John Wood & Paul Harrison’s video work 66.86, we see a small white room bisected by a grid-like sequence of white ropes, held in place by pulleys attached to the walls and floors. The ropes criss-cross one another, like a neat, geometric cat’s cradle, involving only right angles, and create something of a rough cube-like shape in the centre of the image. After several seconds, the ropes begin to jangle and move silently on the pulleys. After several more seconds, a rhythmic shunting sound begins, and black sections begin to appear on the ropes, which had been plain, pristine white until now. The small black sections continue to appear and increase, passing through the space like determined black snakes. Occasionally the viewer might have the impression of the formation of some kind of outline<&ndash>–a sense of purpose to the appearance of the lines. The shunting speeds up and the ropes start to move more furiously, before, in a kind of choreographic marvel, the black sections of the rope settle in the middle of the space to create the perfect outline of a simple chair. As with many of Wood & Harrison’s videos, the idea of off-screen action is compelling here. The unmoving gaze of their cameras, which are often fixed, as here, on a white, box-like interior, creates the impression that you are looking into the inside of a small white cube, perhaps one even as small as the television set on which the films are played. This fixing makes it impossible not to imagine what is happening off-screen. Are the artists maniacally changing the colour of sections of string, to create the neat illusion that we see? The simplicity of the action that we see belies a complexity that happens always elsewhere. The soundtrack, the shunting sound of the moving string, creates an industrial impression, the sound, perhaps, of some kind of chugging steam machine. However the soundtrack is also peppered with short, wailingly electronic noises, which sound like recorded voices played backwards. This turns the reading of the video on its head somewhat, as we start to imagine that the film has been made backwards. That what began with a chair somehow disintegrated. The chair is anonymous, and to some extent, featureless: four legs, a seat and a back in square, rectilinear formation. 66.86 is the first of Wood & Harrison’s works from this period not to feature a figure in the frame (usually one of the artists or both is present, acting as a kind of double act, and carrying out small investigations and experiments). However it shares with many of their other works an interest in drawing, and posits almost a new machine for 3-D drawing, operated by ropes and pulleys (another favourite device). The word ‘draw’ does, of course, also mean, ‘to pull towards’ as well as the meaning that we might associate with a pencil, and here the artist manage to combine the two<&ndash>–creating lines and shapes by pulling rope towards them.